Allows to reduce or to do without a night reception office, and in bigger hotel premises provides additional guest service, without the need to engage receptionists and minimizing the time necessary to attend to large groups of guests. Thanks to its functionality it saves money, reducing the cost of hotel service. Where an automated card machine has been installed, the night reception office becomes either redundant or can be significantly reduced . Cards for the Hotel Guests, regardless of day or night time, are dispensed in an easy and convenient way, without any interference with the hotel system already installed. Thanks to built-in protections, there is no way for a card to be given to an unauthorized person. Possibility to adjust an Automated Card Machine to each, tailor-made order. Integration with the already existing hotel system. Each card in the Automated Card Machine is protected and only authorized persons have access to it. A hotel guest collects his card from the Automated Card Machine on the basis of his individual code, activated for a certain period of time. All the events that occur in the system are recorded by the system and allow detailed reports to be made. Operated with ease, graphical-and- textual messages and voice messages supporting operation of the device in numerous languages. Ergonomic and modern structure of the device, available in any RAL color, will match every interior. 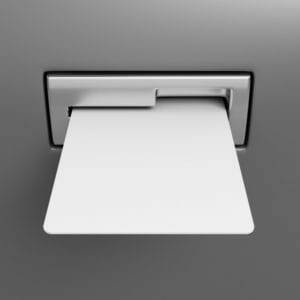 Universal form of the Automated Card Machine allows to hang the device on the wall or to place it anywhere as a stand-alone piece of equipment. Optionally – a built-in camera recording each person collecting or returning cards. We manufacture systems and solutions under our own SAIK brand. In our product portfolio we have a number of interesting products, such as the HOMATIC Building Intelligent Management System, Automatic Reception Office, Porter Support System, but our leading product has become the SAIK Automatic Key Identification System consisting of key deposit safes and their control software. Bt electronics Company is a team of the best specialists available in the field of electronics, precision mechanics, telecommunication and information technology, with the passion for creating new solutions, eager to face new challenges. Thanks to their enthusiasm and qualifications, we are perceived as reliable partners supplying optimal tools which increase safety and protection of our customers. We are open to the needs of our customers, who expect individualized and non-standard approach to a given issue and our adjustment to specific conditions of a given enterprise or organization. The Client books and pays for his stay in a given hotel facility via the Internet or travel agency. In return, he receives an individually-assigned code enabling him to enter the building on a certain date and collect his room card. Where an access control system is installed (a combination lock on the entrance lock) , a so-called „key lock” can be used – leaving the premises is not possible, if the card has not been returned to the Automated Card Machine. Granting authorization to use accommodation facilities is carried out remotely, via the Internet. Each deposit safe is equipped with RCP software (Working Time Recording), which may be used to clear working time of the hotel staff – cleaning staff, maintenance men, etc. Round-the- clock operation of the hotel premises without a necessity to employ the reception staff. Full protection of the premises against access of unauthorized persons. (in particular, where the system is expanded to include the access control function). Possibility of connection with various access protection systems , fire(SAIK Fire deposit safe ) and other systems. Full management and on-line control of the status of the deposit safe and other systems integrated with it (graphic report / text report). Various levels of administrators’ access to the system. Have you not found information you were looking for on our website? Would you like to enquire about a tailor-made offer? Feel free to contact us for any further information! Company: bt electronics sp. z o.o.